CBSE Grading System: The Central Board Of Secondary Education (CBSE) has introduced a grading system for the students of class 10 & 12 from the academic year of 2009 to 2010. So now the students will be awarded on a 5 point scale grading system that is from Grade A to Grade E. The CBSE grading system is decided based on the 2 parameters that are Absolute & Percentile Marks. Also, these parameters will differ from one subject to the other subject. So under the new CBSE grading system, no cumulative grade is awarded only subject-wise grades are awarded to the student. 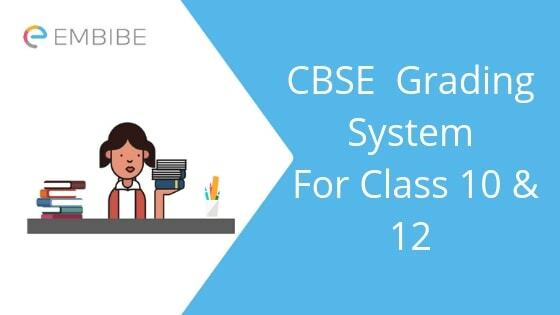 In this article, we will provide you with all the necessary information regarding CBSE Grading System for Class 10 & 12. Read on to know everything about CBSE Grading System. Minor variations in the proportion of candidates to adjust ties will be made. In case of a tie, all the students getting the same score will get the same grade. If the number of students at a score point needs to be divided into two segments, the smaller segment will go with the larger. In respect of subjects where the total number of candidates passing in a subject is less than 500, the grading would be adopted on the pattern of grading and distribution in other similar subjects. CGPA which is commonly known as Cumulative Grade Point Average which is nothing but the statement of subject wise performance in the certificate of continuous and comprehensive evaluation that is class 10 certificate. CGPA is an average grade point of a student. CGPA = Sum of grade points obtained in 5 main subjects/5. Formula: CGPA X 9.5= Percentage Obtained in Class 10. For example: If a candidate has obtained 8.0 CGPA then his/her percentage is calculated as 8.0 X 9.5 = 76%. Now you are provided with all the detailed information regarding CBSE Grading System for Class 10 & 12. CBSE Students can also visit embibe and take Class 10 & Class 12 mock tests for free. Embibe also gives you detailed exam analysis where you can identify your mistakes and further focus on them to improve. We hope the detailed article on CBSE Grading System is helpful. If you have any doubts regarding this article or CBSE Grading system, drop your comments below and we will get back to you as soon as possible.